The Bayern Munich fans did not even have their bratwurst for consolation as a far superior Real Madrid trashed Bayern Munich in their first victory ever in Munich. It was doubly humiliating as Carlo Ancelotti proved to be a far superior tactician and football brain than Pep Guardiola's, who seemed to have completely set his side without considering the Spanish side's obvious strengths in counter-attack. When down 0-3 he seemed to have no idea what to do. Surely a lot of people in Munich must be missing the great Jupp Heynckes. Real Madrid were very close to perfection, dominating every aspect of the game, and with Cristiano Ronaldo on fire. Their only downer was Xabi Alonso's yellow card, which means he is suspended for the final. That said, they will be huge favourites against either Chelsea or Atletico Madrid in the final. I will unashamedly support either of those two sides, but aware that Real Madrid will be favourites. Either side that makes it, it will be interesting: an Atletico Madrid-Real Madrid final will be historic for the city of Madrid, where Atletico will surely fight their heart out to beat their gigantic neighbours. It will truly be a David against Goliath of the city of Madrid. Chelsea-Real Madrid will be more interesting in a footballing sense: Chelsea and Real Madrid play some of the best counter-attacking football right now, and their two coaches, Jose Mourinho and Carlo Ancelotti are two of the best football tacticians in the world. It would be as much a chess contest as a football match. Also, I guess many people will focus as much on the Jose Mourinho-Real Madrid clash, but that is more for the coloured press than for football fans. In a World Cup year there are bound to be many memorable matches, and the final in Maracana, no matter who wins it, will be historic. That said, the best match of the year is unlikely to be in the World Cup, where first round in particular is set to be full of mediocre sides playing not to lose rather than to win. The knock-off rounds are more likely to be dramatic than well-played as the more mediocre teams get knocked out. But what match is vying to be the best of the year? The Champions League final is likely, but more so tomorrow's match in Munich between Bayern Munich and Real Madrid, surely among the best teams in the world at the moment, if not the best. Bayern Munich has very much applied Pep Guardiola's style of possession, but still playing more directly (they shoot more on goal). That said, Pep Guardiola made some tactical errors in the first match which he may have to correct. Firstly, although Rafinha had a fine match against Real Madrid, Javi Martinez seems to be a more obvious choice in the defensive midfield to break the counter-attacks. Phillip Lahm should be back in right-back position, while the core questions are whether Mario Gotze or Arjen Robben should be chosen for the right half, and whether Thomas Muller or Toni Kroos should be offensive midfielders. I personally favour Mario Gotze ahead of Robben, who I think lacks passion the most important matches. Also, while I like Toni Kroos, I think Thomas Muller's defensive abilities and experience will be more important to feed Mario Mandzukic up front. The weakest point may be central defense with Dante and Boateng, but this is a luxury weakness, and the strengthening with Martinez should be enough. In the meantime, Carlo Ancelotti's Real Madrid plays eminent counter-attacking football, getting the best out of an incredible Cristiano Ronaldo, Angel DiMaria, Gareth Bale and even Karim Benzema. In defense Pepe has been extraordinary in the last matches, while the combination of Xabi Alonso and Luca Modric works very well; they are both very complete midfielders with excellent defensive and offensive abilities. On the left-hand side I have been very impressed by the young Isco, who is already a star and is bound to become even better. I am certain there will be goals, drama and a very high level of tactical, physical and technical skills, far above anything we will see in Brazil this year. While the World Cup appeals mostly to petty nationalism (that is why 90% of people watch), the high quality football that real football fans like is what we will see tomorrow. It was not pretty, but it was efficient when a more intelligent Chelsea beat the hopeful Liverpool at Anfield 2-0 yesterday. Of all the people Stephen Gerrard may become the most unlikely anti-hero if Liverpool ends up not winning the championship. It was just a little lack of concentration that can happen to anyone, and happens to great players all the time, but this time it proved fatal when Demba Ba was as cool and firm as an iceberg to score after Gerrard's mishap. Although Willian made it 0-2 at the end of the match, it was Ba's goal that really gave the victory to Chelsea despite Liverpool trying and trying in vain to get through Jose Mourinho's defensive genius. The Premier League title is now open, with Chelsea nevertheless the most unlikely champion: although they are not unlikely to win their last two matches against Norwich and Cardiff respectively, they have to hope that both Liverpool and Manchester City slip. Liverpool has two matches left against Crystal Palace away and Newcastle at home. They must win both matches, and if they don't, they have to hope that both Chelsea and Manchester City will slip. But even winning both matches, the title is not guaranteed. Manchester City is the one that does not immediately depend on any other results: with three matches left they can win the title with three straight victories. However, the task will not immediately be easy; on Saturday they play Everton away. The arch-rivals of Liverpool may be tempted to play softly for the title not to go to the Reds, but the problem is that Everton is also vying for its meager hope of overtaking Arsenal on fourth place to secure a place in next season's Champions League qualifiers. In case of victory against Everton, Manchester City will have to defeat Aston Villa and West Ham at home to take the title. All three of these great sides deserves to win the title (yes, although Jose Mourinho may seem unlikeable to many, he continues to be the world's best manager, and in the unlikely event that his team wins the title, it will be because they deserve it), but two will end in tears. It will be another fantastic and dramatic ending to the Premier League! 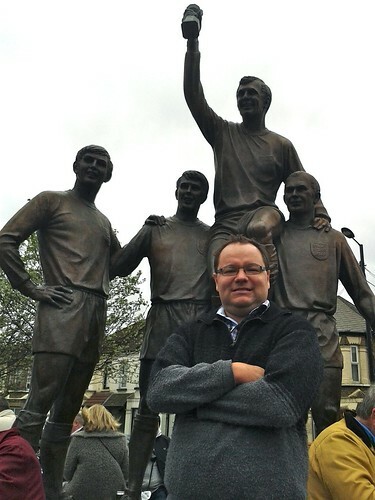 The following photo is of me in front of the statue of the 1966 World Cup winners, Bobby Moore Geoff Hurst, Martin Peters and Ray Wilson, when I recently went to the West Ham-Liverpool game in London. It was great to see Atletico Madrid eliminate FC Barcelona from the Champions League. It would have been perfect if Borussia Dortmund had managed the miracle and and eliminated Real Madrid as well, while Chelsea did well to eliminate Paris St. Germain. In the meantime Bayern Munich were far superior to the poor Manchester United, a team that will not be in the Champions League next season. The semifinals now look exciting: Atletico Madrid-Chelsea and Real Madrid-Bayern Munich. Diego Simeone's men should no longer be underestimated at the face a Chelsea side where Jose Mourinho will undoubtedly study the Spanish side in depth and exploit every mistake. Real Madrid-Bayern Munich is probably the match that most people would have expected to see in the final. Bayern Munich looks like the strongest, and Real Madrid cannot commit mistakes if they are serious about the title. Pep Guardiola knows Real Madrid well, having defeated them many times as Barcelona coach. It will surely be a match to watch! Liverpool are on the verge of doing what many at least, if not impossible, thought unlikely at the start of the season. They defeated Manchester City 3-2, and are now on first place, and it seems only Chelsea will be able to threaten them. But with their splendid form it seems, if not impossible, unlikely that Liverpool should mess it all up. I have to add my own personal experience in this drama. On my way from Liberia to Turkey I passed through London, and went to see the aspiring champions of Liverpool play at West Ham. It was the first time I was ever at a Premier League match. It was a fascinating experience. West Ham are a club full of traidtions, from their bubble song to their links with the legendary Bobby Moore. I enjoyed the atmosphere at the stadium, although I also found it extremely aggressive and negative. In football terms West Ham is hardly an impressive team, and plays quite primitive football. They started the match well, and it was not entirely just when Liverpool went ahead on a penalty kick by Stephen Gerrard. That said, at this time, Luis Suarez had already hit the bar. But West Ham equalized by Guy Demel in a situation where it seemed Andy Carroll fouled the goalkeeper. Andy Carroll was surely the one West Ham player who gave Liverpool trouble, but in the second half Liverpool played much better, and they fully deserved the victory. Luis Suarez hit the bar again, and they were in control. However, the winning goal was on a more controversial penalty kick, again by Stephen Gerrard, which made the home crowd much more aggressive against the away team. In the end this was an important step for Liverpool, and I was happy I was there and may be able to say that I saw them play the first time they ever won a Premier League championship.